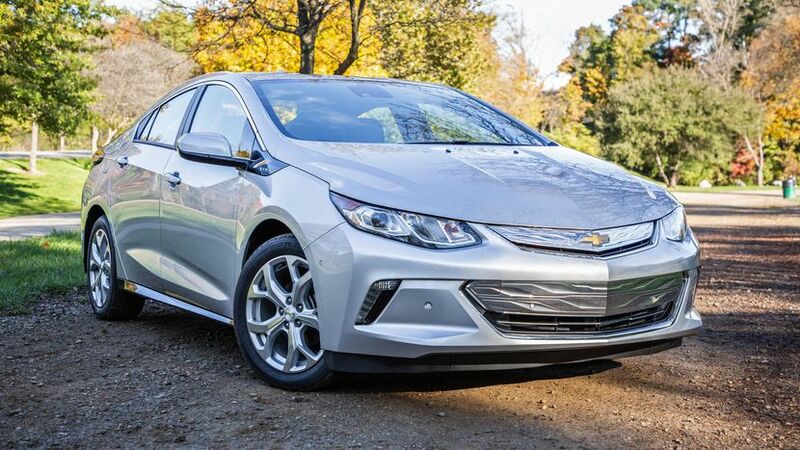 Chevy’s plug-in hybrid charges faster and receives fresh tech. If you’re scratching your head while looking at pictures of the 2019 Chevrolet Volt thinking, man, that looks an awful lot like last year’s car, you aren’t going crazy. While some mid-cycle refreshes are mostly limited to design tweaks, Chevy’s 2019 model year update instead focuses on making the Volt an even better plug-in hybrid. Much as I would have liked to see a few visual changes, really, a design update wasn’t essential. The Volt certainly isn’t off-putting, with its Cruze-like front end and silver grille inserts giving it kind of a Transformers vibe. Packed within the body is a carryover powertrain, comprised of a 1.5-liter I4 gas engine, 18.4-kilowatt-hour battery pack and electric motor, for a combined output of 149 horsepower and 294 pound-feet of torque. The EPA says the 2019 Volt has an all-electric driving range of 53 miles, which bests other PHEVs like the Hyundai Ioniq (29 miles), Kia Niro (26 miles) and Toyota Prius Prime (25 miles). Factor in the gas engine and the Chevy’s driving range grows to 420 miles. A new 7.2-kW charger is among the more substantial 2019 model year changes, available as a $750 option on the base Volt LT model and standard on my Premier trim tester. It drops 240-volt charging times from 4.5 hours to 2.3. Those planning on powering up on a standard household wall outlet still have to strap in for a 13-hour wait. For city commuting, the 53 miles of electric range seems very much in reach. The brake regen components replenish the battery along the way, causing electric range to drop slowly. Even more energy recuperation is possible using the on-demand regen steering wheel paddle, though it intervenes sharply enough to make passengers’ heads bob forward when activated. Pedaling around in Normal mode offers a pleasing mix of gallop off the line and thrust to whip past slower traffic, while not decimating battery charge. What will make electrons disappear at an alarming rate? Sport mode, with its more hyperactive acceleration. Thankfully, a Hold mode can be used to maintain the battery charge on longer stretches of highway cruising, for example, letting the range-extender gas engine do the heavy lifting, saving electricity for your stop-and-go stuff. Heading inside, the biggest news is the updated tech in the center stack with Chevy’s Infotainment 3 system housed in an 8-inch touchscreen. Graphics are crisp with intuitive menus and snappy response times. On my Premier tester, navigation is standard, as is an eight-speaker Bose audio system, Wi-Fi hotspot and both Apple CarPlay and Android Auto. The Premier’s wireless charge pad is also relocated from under the armrest to a more convenient location at the base of the center stack. Other charge points include two USB ports and a 12-volt outlet up front, while backseat passengers have a 12-volt outlet between the seats. On the safety front, the backup camera is now a higher-definition unit and a new pedestrian alert system with external speakers emitting a subtle tone at low speeds are standard. Forward collision warning with low-speed automatic emergency braking, blind-spot monitoring, lane departure warning with lane-keep assist and rear cross-traffic alert are available as options. The rest of the Volt’s cabin is unchanged, with a relaxed seating position, adequate room up front and decent legroom in back, though rear headroom leaves a lot to be desired. In the very back there’s a 10.6 cubic feet trunk that will handle weekly grocery trips, but folding down the rear seats enabled me to cram four packs of Owens Corning R-13 insulation into the hatchback.